Sometimes the simplest of things can be the most satisfying. If you're looking for a unique way to label your outgoing, but don't want to be too flashy, consider this rustic, yet colorful selection. Created from photos of a hand-woven jute rug, these return address labels are a great way to top off your letters and packages with a personalized finishing touch. You'll appreciate the fact that a stylish look isn't all this product has to offer. Since they are self-adhesive labels, the need to scribble out your name and address on every envelope is over! Just stick these on for a simple solution to a tedious task! 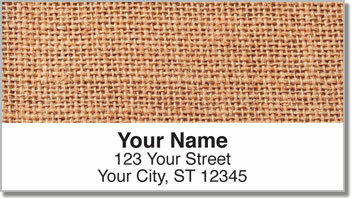 Get your own Jute Rug Address Labels today! You can also order matching personal checks.